Meget flot lejlighed på 150 kvm beliggende på 2. sal med elevator med evnen til at rumme op til 6 personer. En stor stue med 2 store sofaer, to lænestole og et sofabord; og dens store bibliotek. En spisestue med plads til op til 10 personer foran de store vinduer med udsigt over haven. Et fuldt udstyret køkken til din komfort: indbygget køleskab, fryser, ovn, mikroovn, kogeplade gas, opvaskemaskine, vaskemaskine tørretumbler, kaffemaskine, elkedel, brødrister, og alle service og køkkenredskaber køkkener nødvendigt. Desuden et spisebord der er indrettet til at nyde morgenmaden. En master suite med king size seng (180x200) og et stort indbygget forbinding og TV. Meget flot udsigt fra vinduet med udsigt over haven. Badeværelset tilstødende soveværelse med stort walk-in bruser, hans og hendes dræn og toiletter. Et stort soveværelse med en seng på 160 x 200cm og stor forbinding. Den badeværelse med et stort badekar, et walk-in bruser og håndvask. Et stort værelse med seng 140 * 200 og dressing værelse med udsigt over haven. Det har et TV og DVD! Den sengetøj er til rådighed. Strygejern og strygebræt. Our party of five stayed in this three-bedroom flat for three nights in mid-March. It is as pictured-- beautiful and spacious. The bathrooms and kitchen seem to recently renovated, and were very nice. The master bathroom has both a shower and toilet, the other bathroom has a shower and toilet in separate rooms (I think that's convenient for large groups). 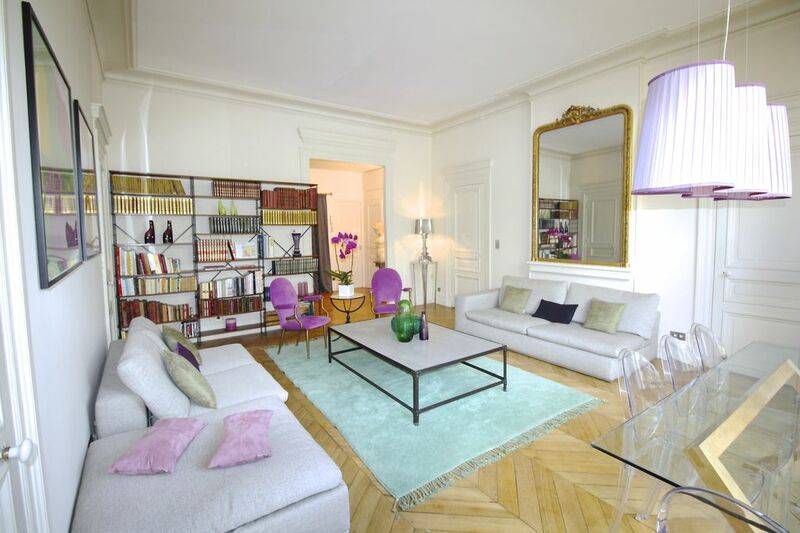 Location is great-- the flat is in an interesting neighborhood with good food, shops and a metro station nearby. It's about a 20 minute walk to the city center. And Michael is prompt in communicating both before our stay and during. We were disappointed with the general maintenance though. There were some wobbly tables and loose shelves that made it concerning to even set anything on them (my brother-in-law's camera was damaged after it fell off the shelf near the entrance). We kept getting locked in the toilet room because the door was sticky/ difficult to open. And a door knob to the master bath fell off the first day we were there. It felt like the place was falling apart on us. Also, there was some basic amenities that should have been in the flat that were not there when we arrived--- we had to purchase our own hand soap, toilet paper and laundry detergent. The flaws of this flat are more annoyances than deal-breakers, but enough for us to consider another place when visiting Paris again. I really thank you for your feedback on your stay. And I am pleased that you enjoyed your stay to the fullest. Thanks to your feedback, we have been able to fix the designated shelve that was a bit loose, and the door of the toilets. I will be a pleasure for me to host you again. Great location, close to the metro and shops and cafes. The apartment is large, comfortable and well-appointed. Beautiful decor, very Parisian feel. We loved this apartment and would return in a heartbeat! -Wow factor as you walk-in: reminiscent of a classic French bourgeois apartment with very high ceilings and all over molding. Makes you feel you are in Paris. -Beautiful dramatic candelabras which, lit with candles at night on the coffee table, add a touch of glamour to the ambiance. -Caution! There is an elevator, but it only starts from the 2nd floor. You have to climb a very high flight of stairs first, before you can get in the elevator. -Michael is very nice and helpful, but very slow to respond, and initially confirmed my booking with the wrong address. I even wondered if it was a scam. It also took about 1 week to receive an email confirming my deposit refund. -Custom designed closets in each bedroom, but hanging rod way too high for normal height people, making the entire hanging closet useless as you need a ladder to go hang your clothes. -No table cloth for the dining table. -French doors handles did not latch. -Master bathroom recessed lights above sink don't stay lit. They shut down after 10 minutes or so.